Govardhan Pooja is celebrated immediately after Diwali in commemoration of Lord Krishna’s victory over Lord Indira. There are many legends about the history of this festival. It is however celebrated majorly in Haryana, Uttar Pradesh, Bihar, Punjab and Maharashtra. It is celebrated under different names in different parts of the country according to the significance of the festival that is prevalent in that area. This festival is more focused on the puja or the prayer ceremony for the deity and not on the celebrants in themselves. 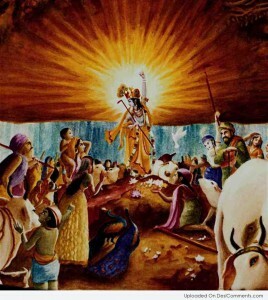 There are many legends that allude to the origin of Govardhan Puja. The most popular of these, states that Govardhan was a small hillock that was located near Mathura at a place called Braj. According to the Vishnu Puraan, that the town of Gokul used to worship Lord Indira because of their belief that he was the one who provided them with rains. The rains were important because their life and livelihood depended on it. However, Lord Krishna told the people that it wasn’t Indra but Govardhan Parvat that brought the rains and therefore the latter should be worshipped and prayed to. When the people followed this ordinance, Lord Indira’s wrath on the people resulted in heavy rains. Lord Krishna then saved the people of Gokul by first praying to Govardhan Parvat and then lifting it on his little finger under which the people took shelter from the rains. This day is also known as ‘Padwa’ in Maharashtra because of the victory of Vamana, an incarnation of Lord Vishnu, over King Bali. It is also marks the day King Vikramaditya was coroneted and is known as the Vikram Samvat. 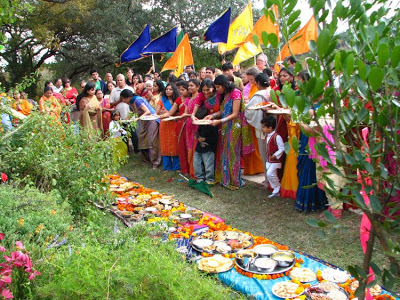 More often than not, this day coincides with the beginning of the Gujarati New Year. However, it is possible for the Govardhan Puja to occur a day before the beginning of the new year. Also referred to as ‘Annakoot’, at Govardhan Puja, devotees prepare 56 or 108 dishes to offer to Lord Krishna. This offering is also known as ‘bhog’. The bhog can also be in the form of a mountain of delectable food items, that is a symbolic representation of the mountain Govardhan. The idol of Lord Krishna in the temples at Nathdwara and Mathura, as well as other places is decked up in fine clothes and precious jewels. Beginning with a bath in milk, the idols are then wrapped in fine fabrics such as silk and chiffon. The colors of these garments are usually red, yellow or saffron as these are considered auspicious by the Hindu community. Ornaments of diamonds, pearls, gold and other precious metals and stones are carefully placed on the idols. The day of Govardhan Puja, also known as Gudi Padwa in some regions, is also celebrated as an appreciation of the love and respect between a husband and his wife. While the wife applies red colored tilak on the husband’s forehead, prays for his well being and performs and Aarti, the husbands gift their wives a token of their appreciation. This can be in the form of a new garment, preferably an expensive saree or gold jewelry as gold is considered to be an auspicious metal. The ornament that is brought can be anything from a necklace to earrings or bangles. On this day, families also invite their newlywed daughters and their husbands for a meal. This get together culminates in the giving of presents to the newlywed. The presents again are either expensive garments or jewelry, preferably in gold. 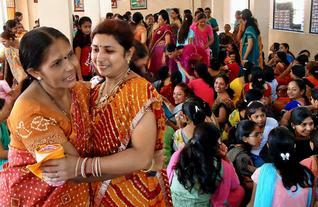 The Gujarati Community celebrate this day in clusters i.e. all the neighbors come together and celebrate this auspicious day as one. As with most Hindu festivals, a pooja of the deities is a must. This is followed by a communal meal, song, dance and the exchange of wishes. The costumes of the celebrants vary from region to region and there is no standard attire that all must wear. However, conforming to Hindu tradition, the celebrants ensure that their attires are ethnic Indian and modest. While the women wear sarees (preferably) or salwar kameez, the men can either wear white or cream colored shirts with pants or kurtas and pyjamas. The sarees worn by the women are colorful as there is no set palette preference for this day. Within the rural or semi-rural regions of the country, celebrants do wear costumes that are specific to their state. The celebration of Gowardhan Puja is not just restricted to India. New Zealand is among some of the other countries where this festival is very popular. Across the globe, poojas are conducted on this day and Lord Krishna is worshiped. Govardhan also translates to the blessings (vardhan) given to human by the cow (go) which is a sacred being in the Hindu culture. Many communities also worship the cow on this day. Besides creating a hillock of food, people also create hillocks of cow dung and celebrate this day by dancing around this hillock. Govardhan Pooja is also symbolic of the gifts that nature gives to human beings and how they must be conserved and cared for.